Lolly is a 4 year old female Cross-Breed. She’s a mixed breed with possibly some English Bull Terrier or other bull terrier (she’s about the size of an English Bull Terrier) who needs a new start in the New Year. She’s safe in our kennels now, but she’s had a hard time and as a result can be almost too eager to please. She needs a calm, quiet home where she will get exercise and long walks. Lolly is a sweet girl who is good with people, loves a fuss, and as far as we can see so far, is fine with other dogs. She hasn’t been tested with cats yet. She could really do with a home where people have quiet time and calm routine – she enjoys long walks and activity but then needs to be able to switch off and resettle in peace and quiet as she can get quite overwhelmed if there is too much to think about or deal with. Beautiful girl who loves to be loved and deserves the best home following an abused past. 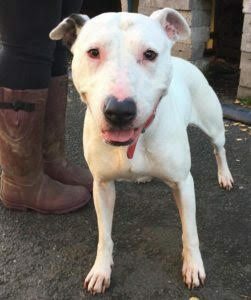 She has a lump on her head that we are told was caused deliberately by her being struck and so we would love to see her in a home that is deserving of a beautiful trusting dog.